1. Cut each chicken breast into 3 large chunks. 2. In a small food processor grind up the ritz crackers. 3. Pour the milk, cheese and cracker crumbs into 3 separate small pans. Toss the 1/4 t salt and 1/8 t pepper into the cracker crumbs and stir the mixture around to combine. 4. 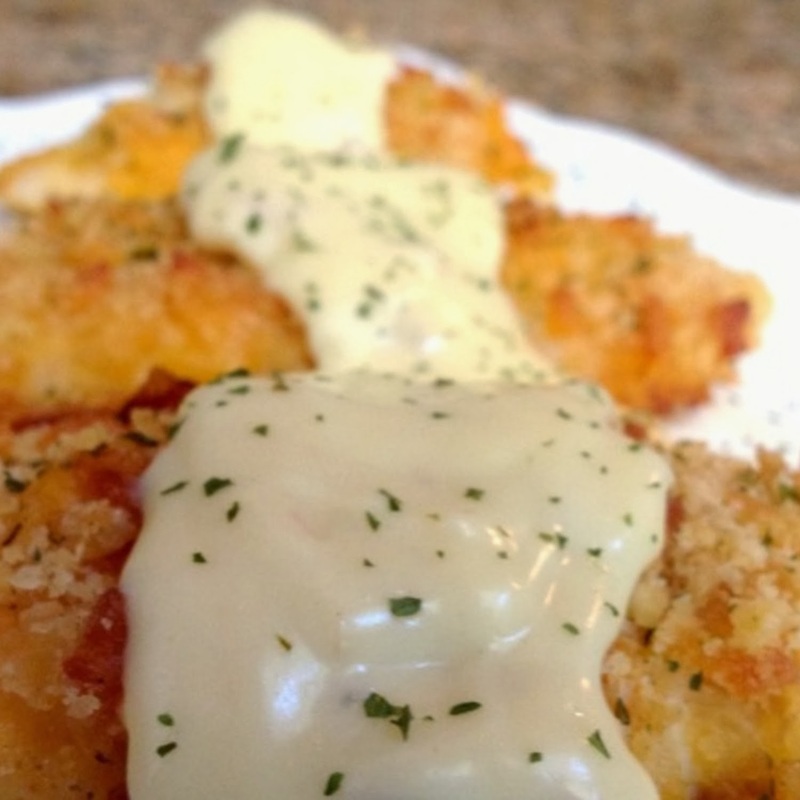 Dip each piece of chicken into the milk then the cheese. Press the cheese into the chicken with your fingers. Some of it will fall off when you add it to the cracker crumbs, don’t worry about it. 5. Spray a 9×13 pan with cooking spray and lay the chicken inside the pan. 6. Sprinkle the dried parsley over the chicken. 7. Cover the pan with tin foil and bake at 400 degrees for 35 minutes. Remove the tin foil, bake for an additional 10 minutes, or until the edges of the chicken are golden brown and crispy. 8. Into a medium sized sauce pan combine the cream of chicken soup, sour cream and butter with a whisk. Stir it over medium high heat until the sauce is nice and hot. Serve over the chicken.